Despite efforts by Beijing to invest in Canada’s vast natural resources, challenges remain. China National Offshore Oil Corporation's (CNOOC) $15.1 billion bid for Canada’s Nexen energy, a Calgary-based firm with oil assets in the Gulf of Mexico, the North Sea, and in Alberta’s oil sands, is highlighting the pros and cons of State Owned Enterprises (SOEs) investing in North American resources. Chinese SOEs have long been major players in resource developments in Africa and in underdeveloped countries on China’s periphery like Myanmar and Laos, where their financial and political heft has, more or less, given them carte blanche to do as they please. Their forays into North America has been much less successful, however, with Minmetals move to acquire Canadian mining giant Noranda in 2004 having been defeated as a result of strong public opposition, negative reactions (it was eventually dropped) and CNOOC’s bid for Unocal meeting a similar fate the very next year. But China’s SOEs have learned their lessons and are taking a more sophisticated approach, acquiring minority holdings in several oil sands producers, and preparing the political ground better than in the past. 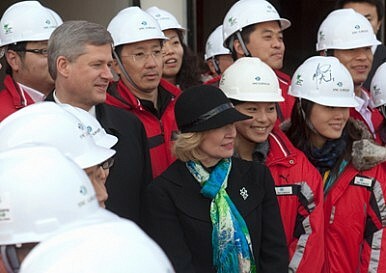 CNOOC’s bid is helped by the fact that Canadian Prime Minister Harper has been actively courting Chinese investment and markets for Canadian oil and gas. Encouraging Chinese investment in Canada was a central feature of Harper’s last visit to China in February, and since the rejection of the Keystone XL pipeline by the Obama Administration, a facility that would have significantly increased Canadian oil exports to the US, Harper has made a point of saying that Canada is ready to sell its oil and gas to those who want to buy it, a not so subtle invitation to Beijing and other Asian nations. The Canadian oil industry seems to be generally onside with the acquisition although there are those who caution against allowing SOEs to expand their role. The provincial government in Alberta has likewise shown no sign of opposition, leaving it to the federal government in Ottawa to make the call as to whether or not this investment will bring “net benefit” to Canada. Since the rules for “net benefit” have not been clearly defined, the government has ample scope to either approve or reject CNOOC’s bid, depending on its political calculations. Given Mr. Harper’s overtures to the Chinese, as well as the possibility of the two countries launching free trade negotiations at some point in the future, the chances are good that the takeover will be approved, probably subject to some undertakings regarding maintenance of substantial operations at Nexen’s operations in Calgary. Some commentators have called for Canada to use China’s interest in acquiring more oil, gas and mineral assets in Canada as a negotiating chip in the forthcoming FTA talks, should they be launched. The bid could face obstacles in the U.S., however, given that Nexen has holdings in the Gulf of Mexico. U.S. Senator Chuck Schumer, a longtime China skeptic, has signaled that he has concerns over Chinese acquisition of U.S. resources and wants the deal reviewed by the same process that persuaded the Chinese to withdraw their Unocal offer. A decision by the U.S. to disallow CNOOC’s acquisition of the Gulf of Mexico assets would force Nexen to divest them. Meanwhile, all is not smooth sailing for a proposed Northern Gateway pipeline that will have to be built from the oil sands in Alberta through the neighboring province of British Columbia (BC), to a planned terminal on the north Pacific coast, if Canadian oil is to be moved to China or elsewhere throughout Asia. Not only are most aboriginal groups, across whose traditional territories that pipeline will have to cross, opposed, but the BC government has laid out five conditions that it says will have to be met if it is to give its approvals for the pipeline and tanker terminal. One of these is that BC receive a greater share of the benefits of the project, a demand that Alberta premier Alison Redford has flatly rejected. While this inter-provincial standoff continues, there are many other hurdles that must be overcome before Alberta oil finds its way to the west coast, and from there onto China-bound tankers. None of this, however, will prevent Beijing from, acting through CNOOC, Sinopec, and other SOEs, using its deep pockets to obtain greater access and control over energy and natural resources in North America, especially in Canada where the political dynamic is more favorable to Chinese interests than in the United States. The Nexen acquisition, if approved, is likely to be the harbinger of more forays by Chinese SOEs into Canada. Hugh L. Stephens is Executive in Residence at the Asia Pacific Foundation of Canada, in Vancouver, with 35 years of government and business experience in Asia. He is also principal of Trans-Pacific Connections.